edited and compiled by Katherine Brown-Hoekstra. The Language of Localization defines 52 terms that every business professional should know, even professionals who do not specialize in localization. In a global market, every business person needs to understand the importance of localization and be able to speak intelligently with localization professionals. Expertly compiled and edited by Katherine Brown-Hoekstra, this book is a useful reference for localization experts, managers, students, and any business person who works in a global market. 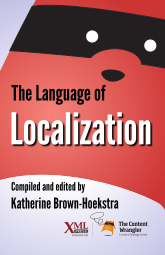 The Language of Localization is a collaborative effort with fifty-two expert contributors, all known for their depth of knowledge. You will probably recognize many of their names, and you will probably want to learn more about the ones who are new to you. Each contributed term has a concise definition, an importance statement, and an essay that describes why business professionals need to know that term. You will find basic terms, such as character set, alongside newer terms, such as augmented translation. They span the depth and breadth, as well as the past and future, of localization. In addition there are short definitions of 70 additional business, linguistics, and standards terms. For those who want to dig deeper, there are more than 150 references for further exploration. Terms are grouped into six categories: Core Concepts, Advanced Concepts, Localization Engineering, Terminology Management, Marketing, and Standards. Katherine (Kit) Brown-Hoekstra is a Fellow of the Society for Technical Communication (STC), former STC Society President, and a member of the Colorado State University Media Hall of Fame. She is an experienced consultant with over 25 years of experience in technical communication and localization. As Principal of Comgenesis, LLC, Kit provides consulting and training to her clients on a variety of topics, including localization, content strategy, and content management. She speaks at conferences worldwide and publishes regularly in industry magazines. Her blog is www.pangaeapapers.com.